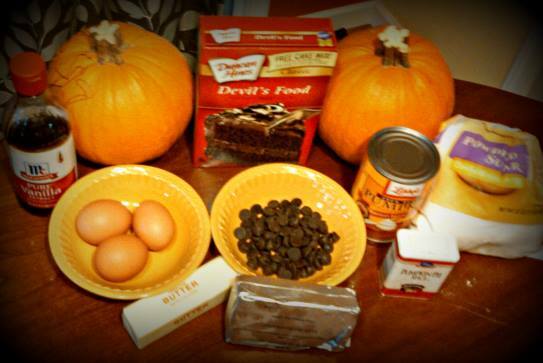 How could I let another week go by without another pumpkin recipe? Hopefully, you’re not getting tired of them. I mean there has been a pretty decent variety of pumpkin recipes and this week it’s a little unique. 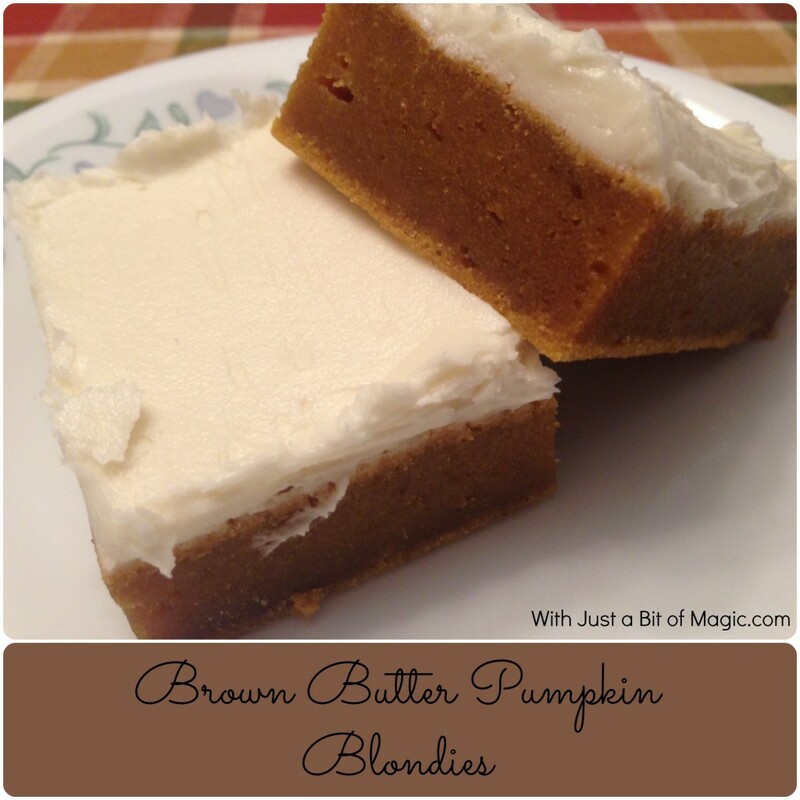 It’s a brown butter pumpkin blondie recipe topped with a rich & creamy cream cheese frosting. I dare you to try and eat more than one of these and not get a stomach ache! I made mine very simply and left out all of the various extras that you could put in them like nuts, chocolate chips, white chocolate chips, and butterscotch chips. Besides I really wanted to add the cream cheese frosting and I didn’t have any of the extras. So are you wondering about brown butter? Brown butter is butter that has been slowly warmed until it is a light brown color and has a nutty flavor to it. 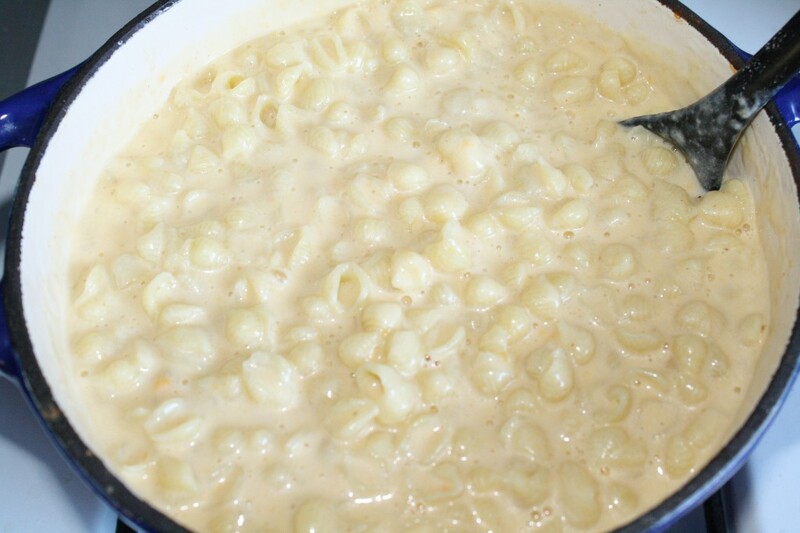 The butter is cooked long enough to turn the milk solids and salt particles brown while cooking out any water present. It has a more complex flavor than melted or clarified butter. Brown butter can replace the butter in just about any dish and gives it an extra layer of depth. Honestly, in this recipe you can use regular butter if you want. This was my first attempt at making brown butter even though I’ve known about it forever. I was always to chicken to try it and didn’t want to ruin it. It was so easy and I’m glad that I added it to the blondies. In a heavy bottom pan heat, whisk sliced butter occasionally while it warms over medium heat. As it heats it will foam a little bit... just remember to keep whisking and don't let it burn. Cook, stirring constantly, until the butter becomes a light tan color. Remove the pan from the heat. The butter will continue cooking even after you remove it from the burner. I poured mine into a small bowl to cool. 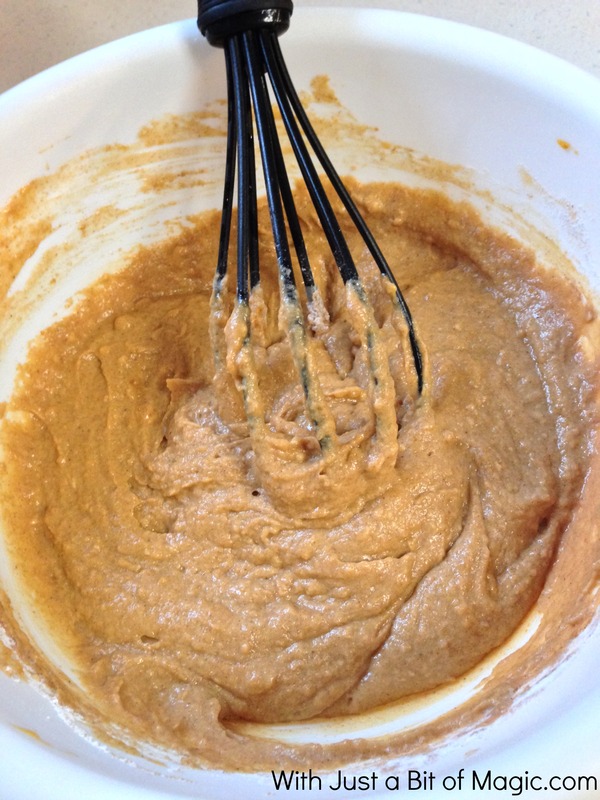 Sift the flour and pumpkin pie spice together and set aside. Whisk the brown butter and sugar together until smooth and then add in the egg and vanilla. Mix well. Stir in the flour. At this point you can stir in some of the extras I mentioned before if you want. 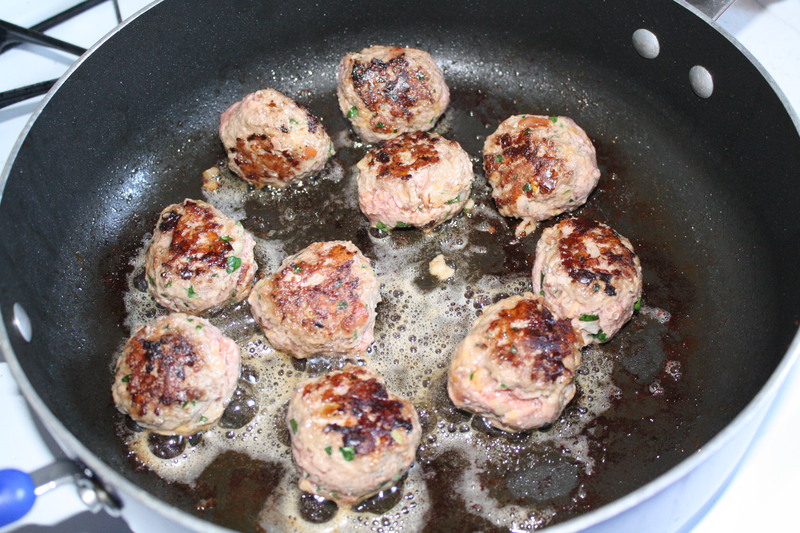 Pour into a prepared 13x9 pan and bake in a 350 degree preheated oven for 30 - 35 minutes. A toothpick should come out clean when inserted into the middle. Let cool before frosting if you're want them frosted. Now grab a cup of coffee and enjoy! Don’t forget… if you have a favorite fall recipe that you’d like to share here I would love to have you guest post here. It’s Friday and we’re rounding out this week with an awesome Fall Favorite! 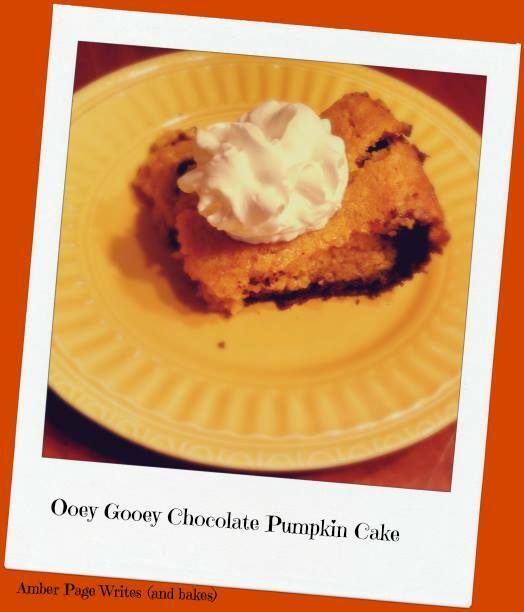 Ooey gooey pumpkin and chocolate cake from Amber of Amber Page Writes. This cake sounds sinfully rich, delicious, and full of flavor and I’m sure that it’s something that I’d want to eat all of in one sitting if I could. I’ve been waiting all week to share this with you… and now you have something to do on Saturday! So who’s Amber? She is the mommy of one sweet, sassy toddler. Wife of a handsome, kind and very, very patient man. Copywriter for an ad agency. And blogger, of course. You can follow her on Twitter and Facebook. Some foods beg to be made in front of an audience. Delicious-smelling, yeasty breads, perfectly-charred steaks, fancy cocktails… the list goes on. And then there are those that should be made in private. Not because they’re not delicious, but because you don’t want anyone to see what goes into them. The recipe I’m about to share you is one of the latter. How do I know? Because this was the conversation I had with my husband this evening. In other words, this cake, it’s not good for you. At all. Although it does have pumpkin it. So you know. There’s fiber. And vitamin A. And beta carotene. Oh, and calcium from the cream cheese. Hey, it’s a regular health bonanza! Healthy or no, it is 100 percent delicious. This is the conversation we had after he took a bite. So there you go. Bake it in private. Share it with everyone you love (or don’t. It’s up to you). Bake for 45-50 minutes. The sides should be set, but the middle will look more like pudding (it is a gooey cake, after all). 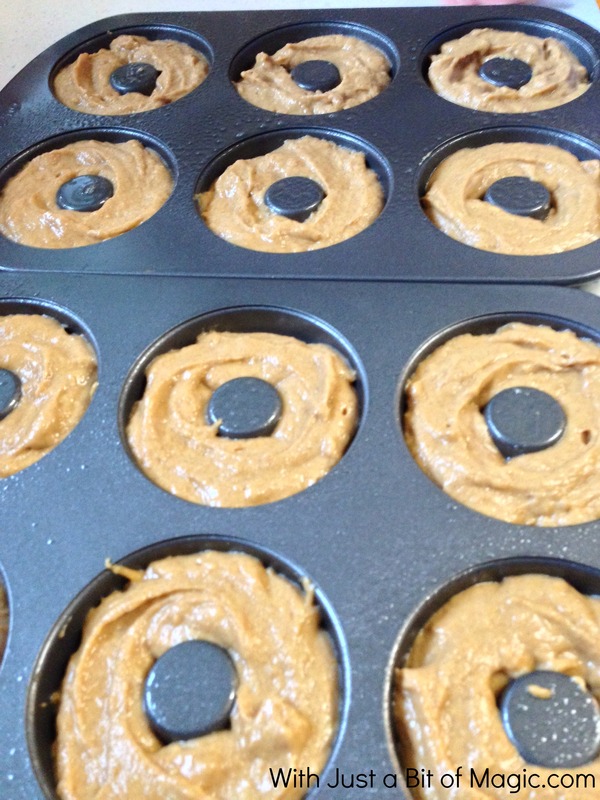 I’ve mentioned it about a half dozen or more times but I love fall & pumpkin treats! One of my favorite treats lately has been pumpkin donuts… crisp on the outside, soft and warm on the inside, a little spicy, and a sweet from the cream cheese frosting that is spread over the top… the downside is that those delicious deep friend treats are pretty high in calories and it can get expensive to buy them every day. So what did I do? 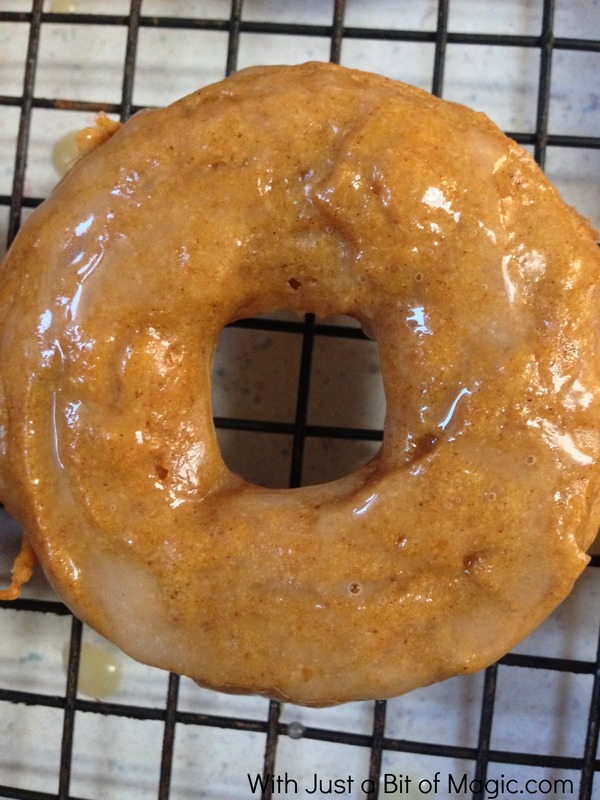 I baked some up cider glazed pumpkin donuts this weekend to have for breakfast with some fresh cider that we picked up at the the local farmers market. 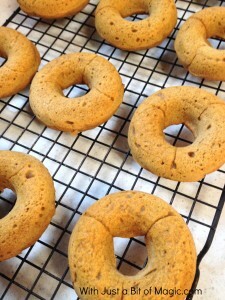 Baked donuts can be just as delicious as their deep fried siblings but are a little healthier and a lot easier since you don’t have to deal with a vat of super hot grease. To try and keep the calories down a little more I substituted fresh applesauce for the oil and egg substitute for the regular eggs. 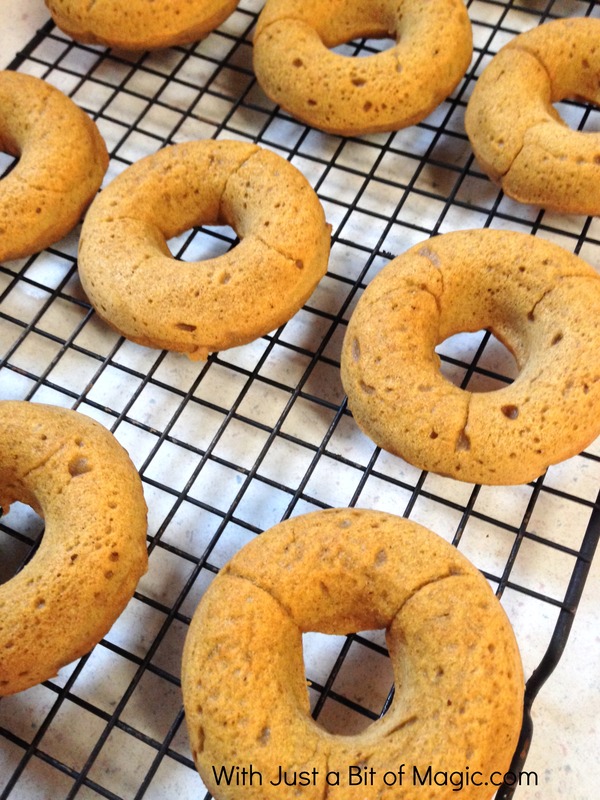 The only downside is that the donuts tend to be a little more dense but the flavor is exactly the same and they are very moist, full of pumpkin & spice flavor. As these baked the house filled with the smell of spices and pumpkin. It was such a warm, inviting smell that I couldn’t wait to eat one… or two. 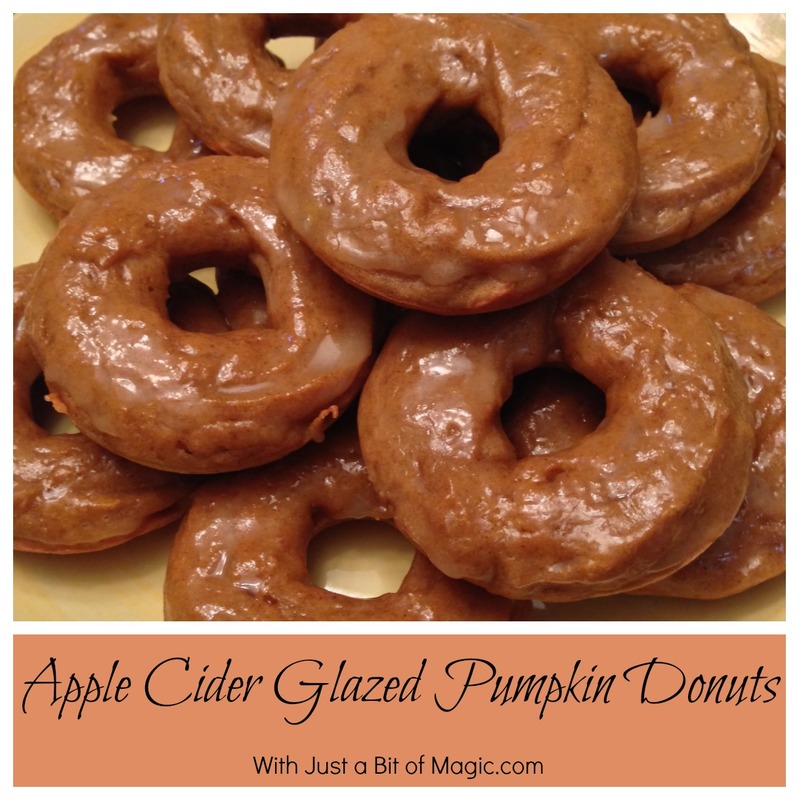 I think that the cider glaze gives them a little extra flavor… and it’s better than just a regular glaze made with water. 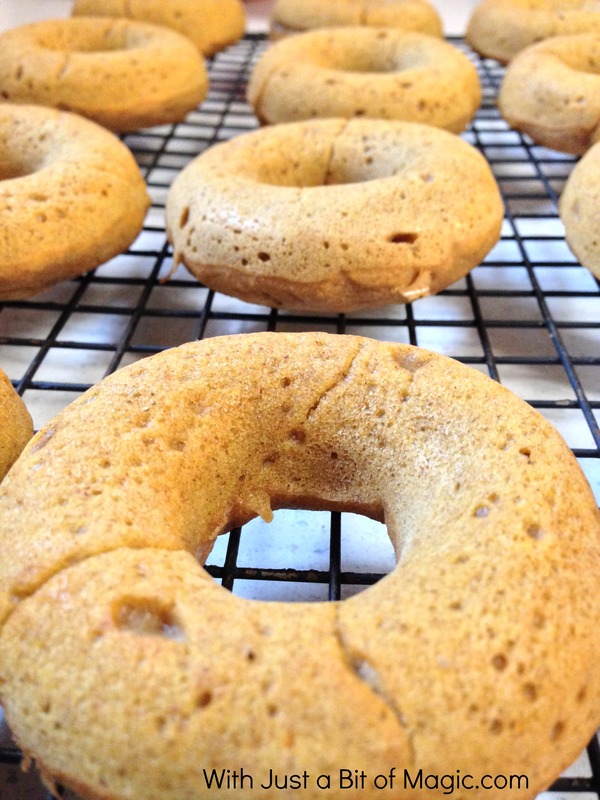 The flavor is delicious but subtle enough that it doesn’t overpower the pumpkin, which is the star of these tasty donuts. You also leave them plain for dipping in coffee, rolled in powdered sugar, cinnamon sugar, or topped with a bit of cream cheese frosting. These might just become a weekend staple around here this fall and winter. Adapted from Can You Stay for Dinner’s recipe. 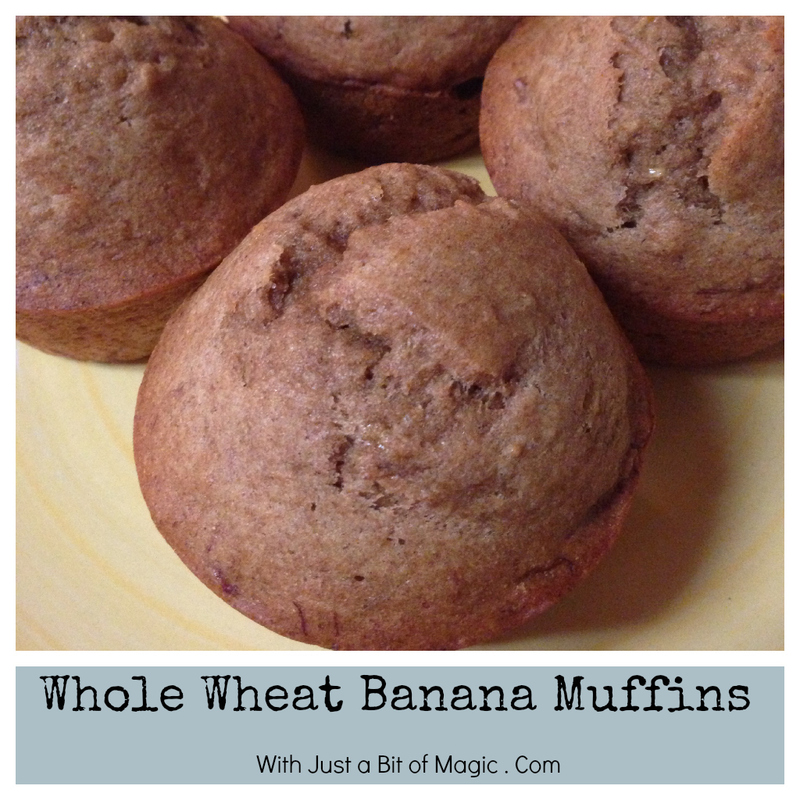 Over the weekend I shared a picture of the whole wheat banana muffins that I was making for our weekend breakfast on Instagram and a couple of people asked me to post the recipe. I was pretty excited! I don’t ever remember anyone asking me to post a recipe on my blog! 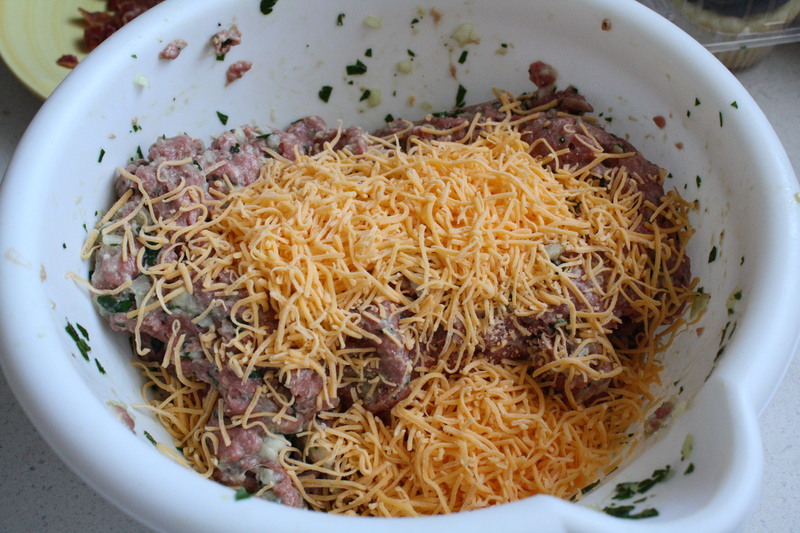 Stir the dry ingredients together in a bowl and set aside. Mash the bananas in a small bowl. In another large bowl whisk together the coconut oil and honey until combined, add in the eggs and then bananas. Whisk until their all combined. Add the dry ingredients to the wet and alternate with the hot water (to make it easy add the vanilla to the water). Make sure that you mix well after each addition. Scoop the batter into the prepared muffin tins. 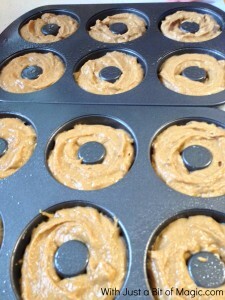 I used a large muffin pan and a regular sized one and got 6 large and 12 regular. You can use any combination that you want. For the regular sized muffin pan bake for about 15 minutes. They were good! Even more than that they were a bit more healthy than the traditional recipe that I normally make which is full of butter. Yes… that is butter on the muffin you in the picture there… I had to. Why? Everything is better with butter even if it’s not healthy for us. As a simple, base recipe this is pretty good. But I think that you could jazz them up (that sounds lame doesn’t it?) by adding in some oatmeal, diced apples, chopped walnuts, or even a few mini chocolate chips. 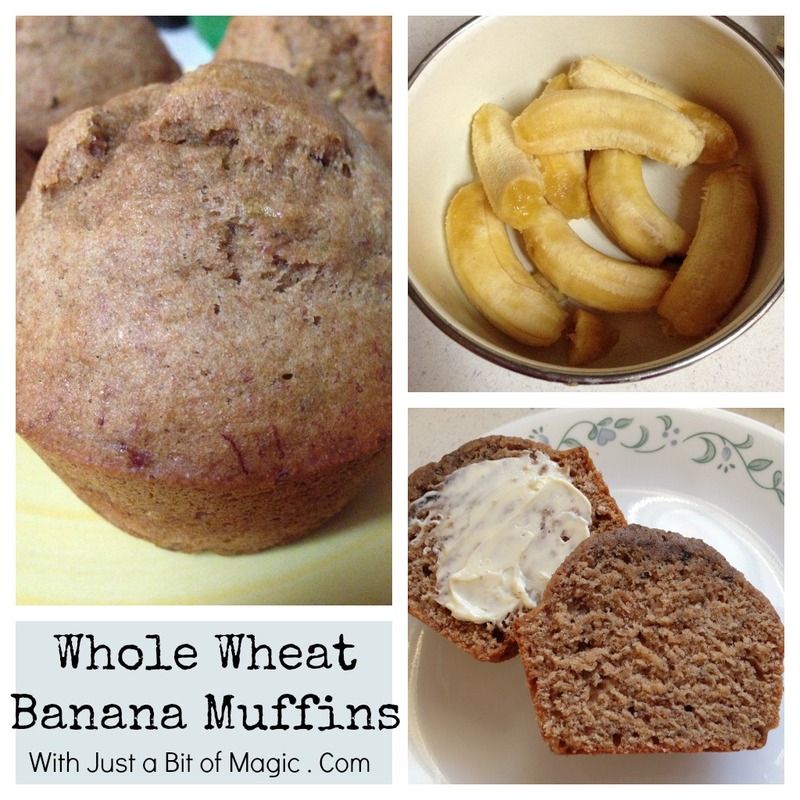 I’ve been trying lately to find way to make some of my baked goods a bit more healthy by using less butter or vegetable oil, sugars, and white flour. Obviously this isn’t going to work for everything but muffins are a great start. What do you do to make your recipes a bit more healthy? Fall is upon us and that means cozy sweaters, warm boots, and delicious soups & stews that warm us from the inside. It’s no wonder that it’s my favorite time of the year. This week on the Monday Menu I have another tasty recipe or so I think. 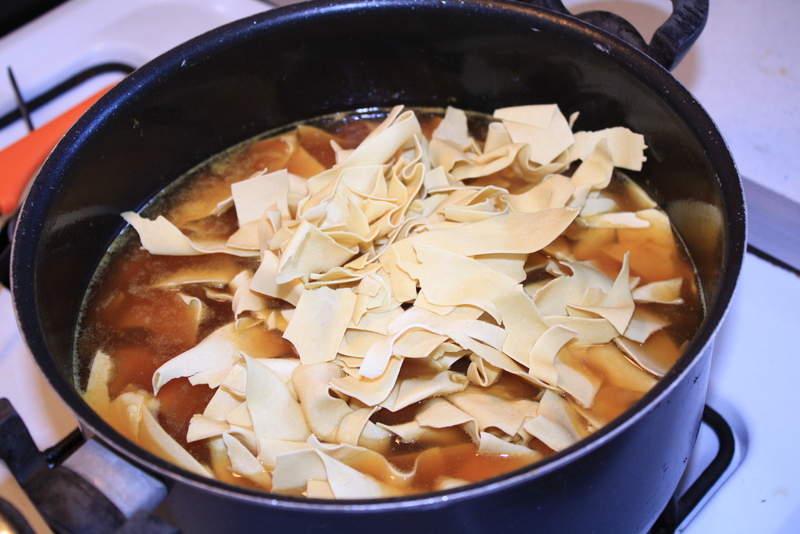 Homemade chicken soup with huge egg noodles! 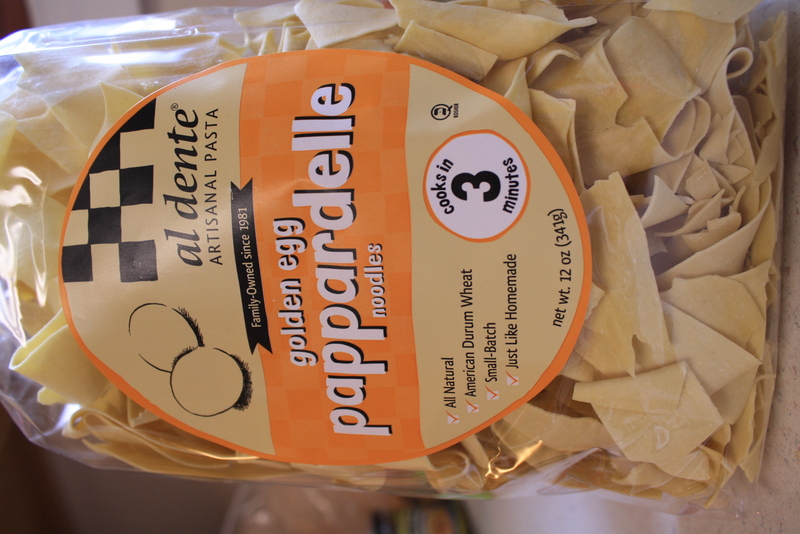 While I was at the Mitten Mom conference I was given a package of Al Dente Pappardelle. 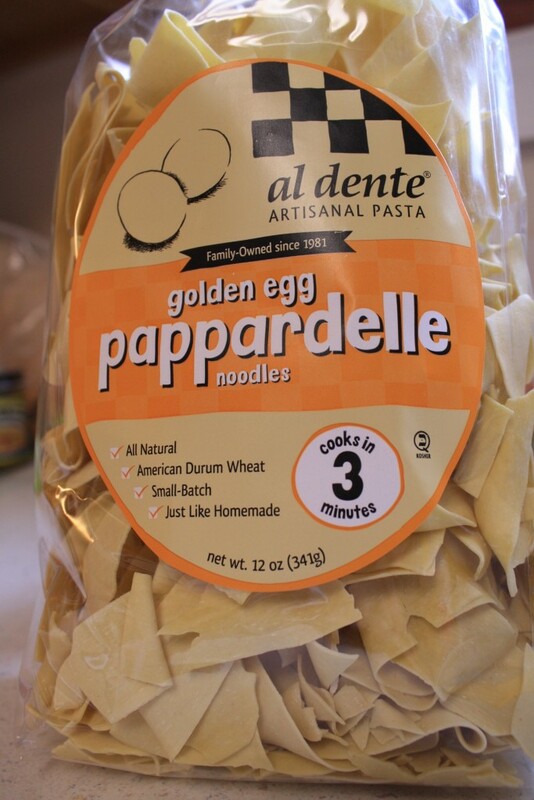 These are the most delicious egg noodles ever… and more importantly the company is based right here in Michigan. Yes, another amazing product made right here in the mitten state. Al Dente uses only the best ingredients from the wheat to the spices and care is taken in all of the varieties that they offer such as Spinach, Egg, Garlic Parsley, Basil, Squid, Wild Mushroom and Spicy Sesame. They also have whole wheat and reduced carb options too. Okay, so back to my recipe. The ingredients are really simple and you can make the recipe simple or take more time and really go all out with it. 3 Chicken breasts – bone in with skin. Put everything in a large stock pot and then fill with enough water to cover everything. Bring it to a boil and then let simmer for 2 hours. Remove from the heat and pull the chicken out and put it on a plate until cool enough to handle. Strain the broth through a fine sieve. 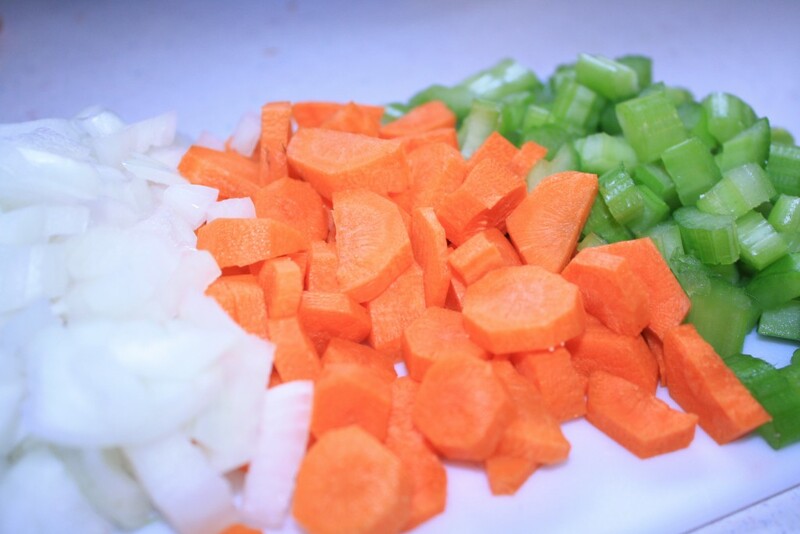 In a large pot or dutch oven saute the onion, carrot, and celery just until they start to soften. Toss in the bay leaves, pour in the broth, and then bring it to a simmer. 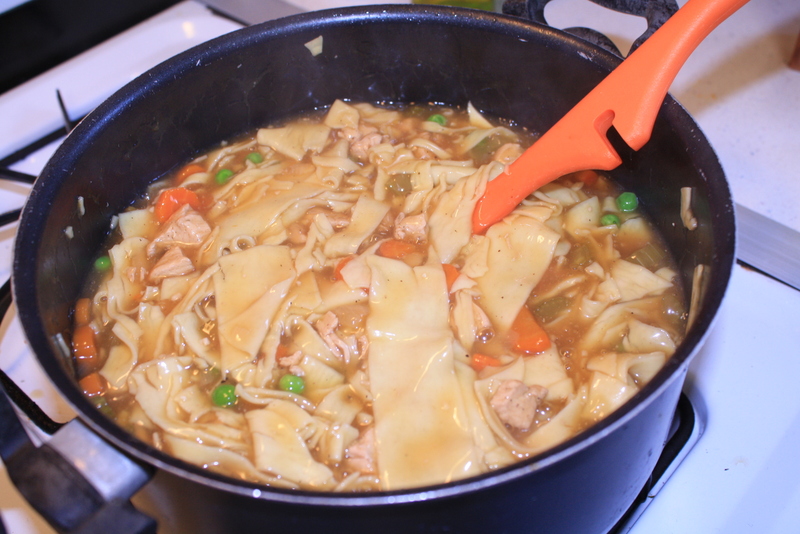 Cook for about 5 – 7 minutes and add in the chicken and the noodles and cook until the noodles are done. Pull out the bay leaves and enjoy! 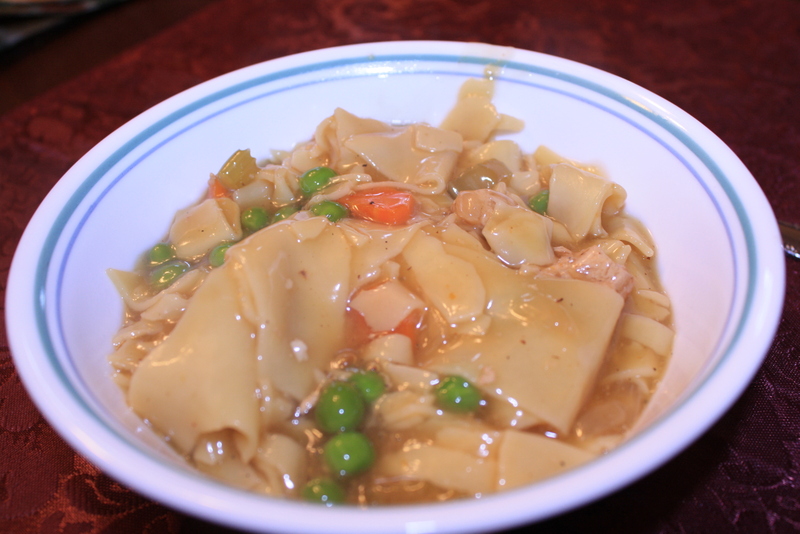 I tossed in a hand full or two of frozen peas when I put the chicken and noodles in just for some extra flavor/color in it. But look at those awesome noodles! I love really wide egg noodles in my soup and the next day they soak up a lot of the broth and it makes the soup really thick. You can also thicken the soup up with some corn starch or flour and serve it in homemade bread bowls. No matter how you make it your family is sure to love it. What is your family’s fall favorite soup? A few weeks ago I spent the weekend up north in Petoskey, Michigan at a wonderful conference, Mitten Moms Blog Conference & Retreat. 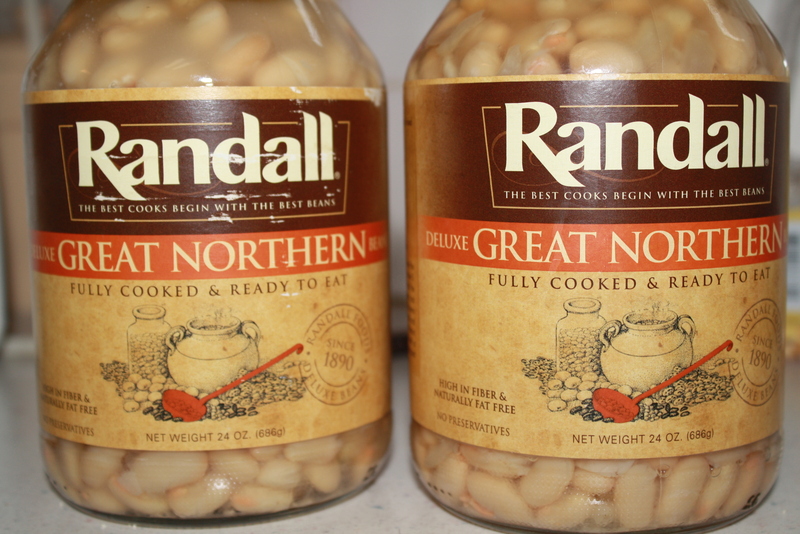 It was a great weekend and one of the awesome things that were in the swag bags were Michigan made Randall Beans. I love beans too! 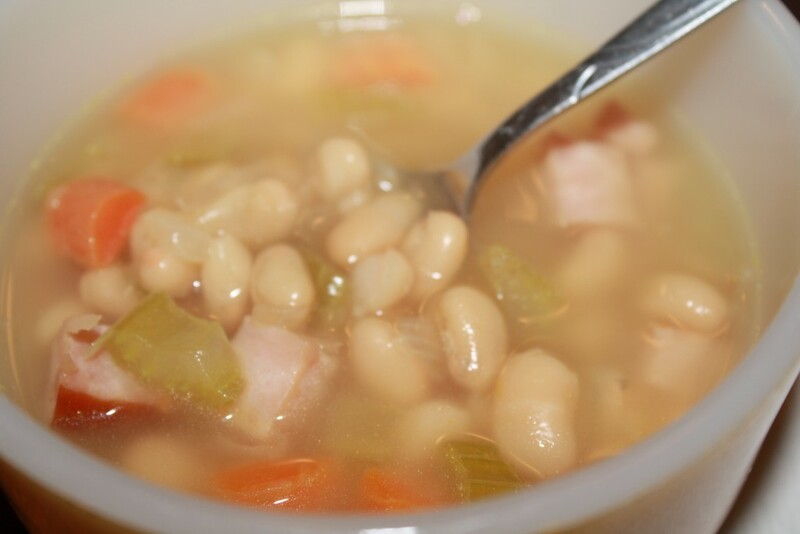 But one of my all time favorite comfort foods is soup and bean soup is one of those things that brings me back to my childhood. As a child my dad would take me with him to various muzzleloading shoots (something similar to this) and they always had this huge black kettle of bean soup simmering over an open fire, to me it looked like a huge cauldron. It was the smell of the soup mixed with the burning wood, cool crisp fall air, and gun powder that was so warm and familiar to me. 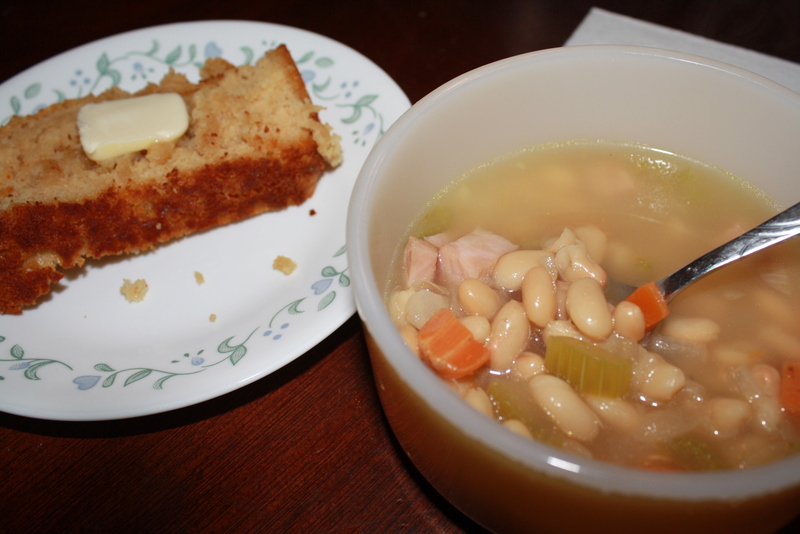 Every fall I try to recreate that feeling by making my own pot of delicious bean soup. Yes, try… because it never turns out perfect, but then again I’m not cooking it out over an open fire. 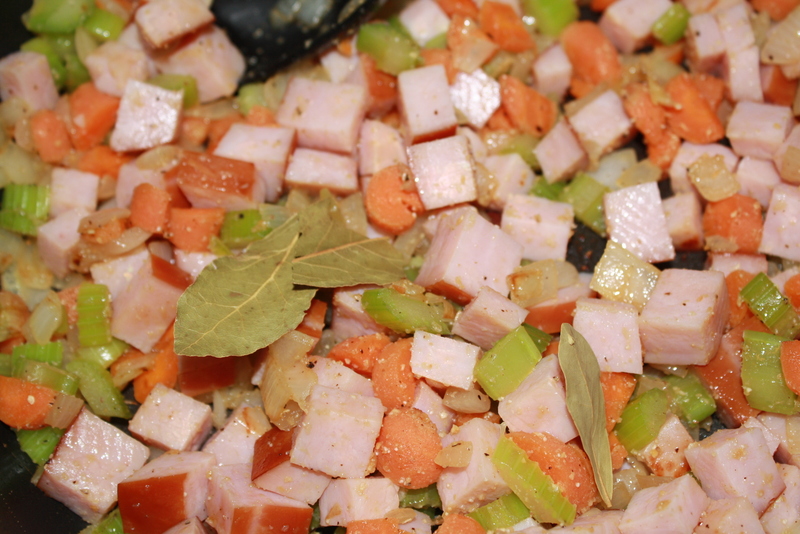 Heat the oil in a large pan and saute the veggies just until soft and fragrant and then add in the garlic and ham. Stir for a few minutes and add the broth. I’ll admit that this time I didn’t use a homemade broth and thought that I’ve try something new. 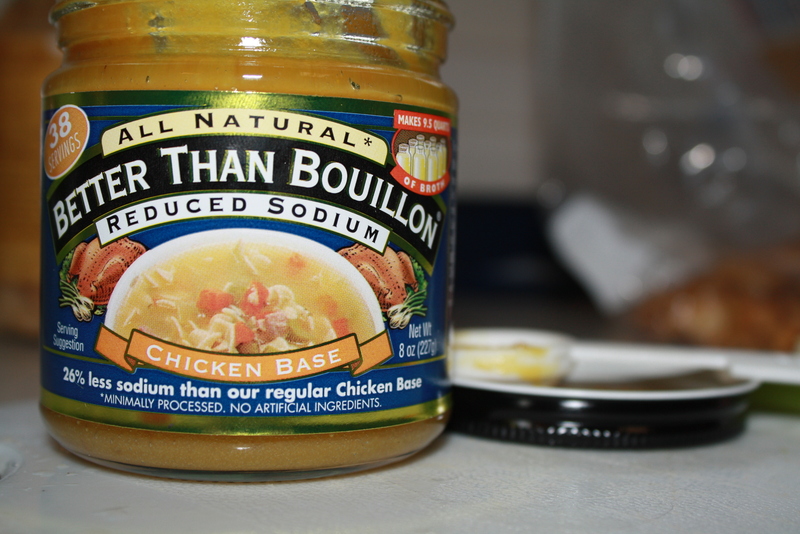 This Better than Bouillon stuff is pretty good! I followed the directions on the jar to make the 6 – 8 cups of broth that were needed for the soup. Bring it up to a simmer and let it cook for about 10 minutes before adding in one of the jars of beans and returning to a simmer. Let this cook covered for about 30 minutes or so. Now, the 2nd jar of beans I mash up and add into the soup during the last ten minutes of cooking or so just to thicken it up a bit. Like I said earlier, it wasn’t perfect but it was still incredible and it’s even better the next day! This is great with some warm, homemade bread or corn bread. Oh yea… I almost forgot… remove the bay leaves before you eat it! If you’re a busy mom … wait, aren’t all busy? Maybe you work full time but still love to cook from scratch for the family, then you have come to the right place. As you probably already know, cooking in big batches and freezing is the easiest way to feed the whole family. And there’s nothing more fun and inviting than placing a big plate of hot, home cooked food in the middle of the table and letting everyone dig in. It is of course nice to experiment with complicated recipes, but as you know, baking in big batches is much easier, quicker and hassle free. You’ll find that making all-in-one casseroles and soups saves you a lot of time; you might find that it even gives you a spare half an hour to read your book, play a quick round of bingo at Cheekybingo.com or catch up on your favorite show (Once Upon a Time for me!). 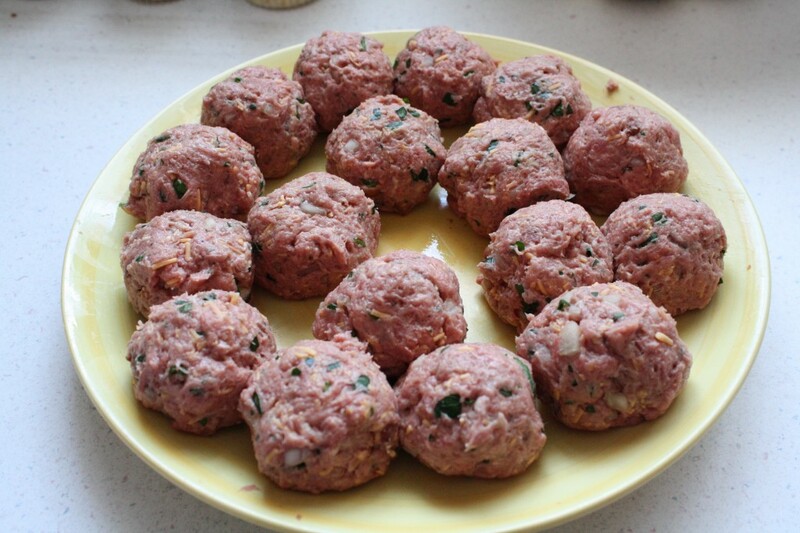 Below is a great family recipe you are sure to like and best of all it’s pretty easy & fast. This recipe is perfect for feeding the whole family. Your kids are sure to love the sound of sausage and beans, and it makes a fun Friday night meal. Seasonings: Thyme, rosemary, garlic, fennel, salt, and pepper are all options that you can use in this dish. In a large casserole dish, fry the onion, chopped carrot and sausages until they are brown all over. This should take about 10 minutes. Next, pour in the tomato sauce and add in a squeeze of tomato paste. Season well and stir in the beans, along with the sugar and the mustard. Bring the whole casserole to simmering point, cover and cook for 25 minutes. Remove from the oven, pour in the peas and cook for a further 5 minutes. 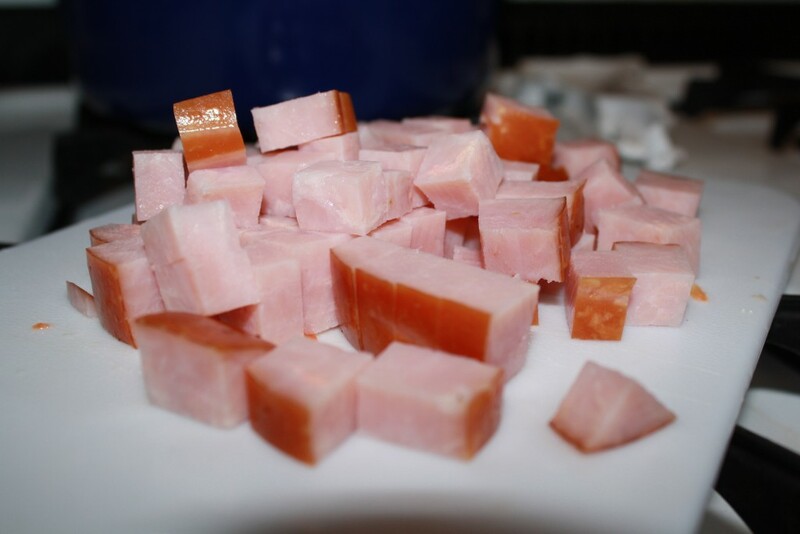 If you double or even triple it you can portion it out and freeze it for busy nights when you don’t have time to make something. This warming and filling casserole is great served with crusty bread, rice or pasta, and a big green salad. Monday Menu ~ Fail or not? I don’t know what happened this week but I guess I didn’t make anything that was really worth writing about and of course that leaves me without something awesome to share with you. Don’t get me wrong… I did feed my family but it was all pretty lame stuff… taco salad, leftovers, and stuff like that. We may have even gone out once too. So, I failed. But I didn’t want to not post something because there are a few things that I made this week I can share with you that were tasty but they were from a mix or a recipe from someone else. This tasty thing you see above is a banana chocolate chip monkey bread! It’s a mix that I picked up at Target while there a couple weeks ago and let me tell ya… totally worth it! It was warm, gooey, sweet, and perfect for a weekend breakfast with a large glass of milk (because without it you can’t get through a couple bites). 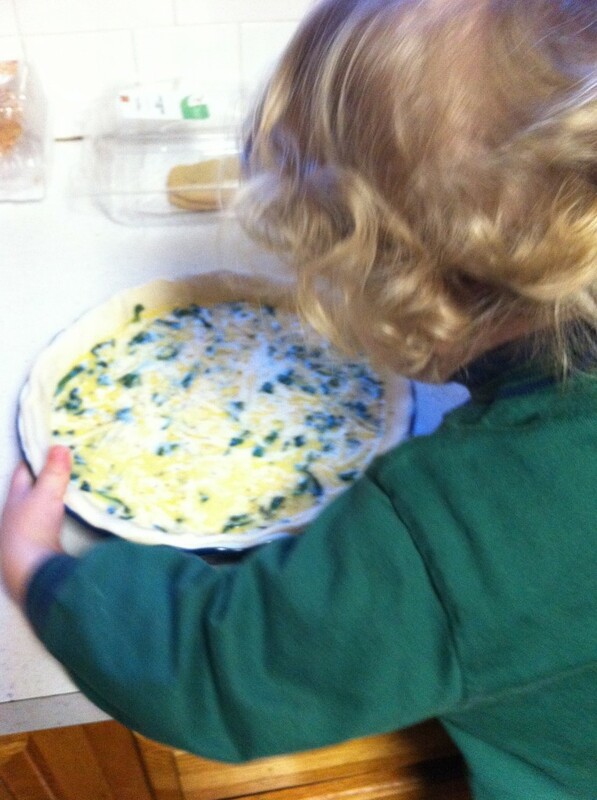 The one thing that I did make this week that was mostly homemade was a spinach and Gruyere cheese quiche. I have to say that it was pretty amazing, but then again how can you mess up a quiche? I mean it’s eggs in a pie crust and if you’re lazy like I am you buy the crusts pre-made and egg beaters to make it simple. Andrew really loved it… can you tell? He helped me make it by pouring the eggs and stirring it again and again once it was in the pan. I only wish that he would have actually eaten some for dinner… he didn’t even touch it. Brownies! I love chocolate (who doesn’t?) and brownies, but because I hadn’t gone shopping last week I didn’t have eggs which we all know are key to making just about anything. Well, I found an incredible brownie recipe that doesn’t require eggs. 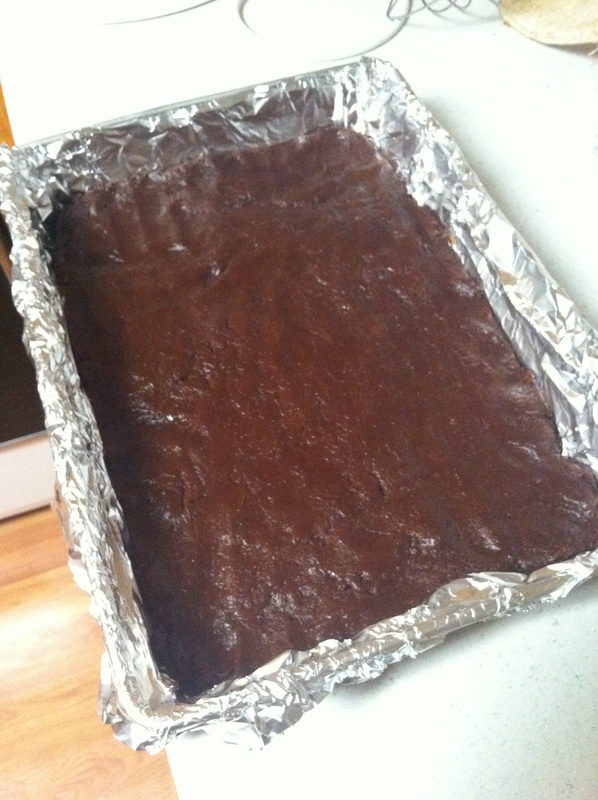 These brownies are fudgy and are just like something that you can make from one of those box mixes. The only changes that I made were that I left out the honey, used all white sugar, and threw in some chocolate chips for good measure. Oh! And if it weren’t for my brownie craving I wouldn’t have found the chocolate cake recipe to end all other recipes! Seriously… check out the Chocolate Wasted Cake! What you see above is the most wonderful meatloaf ever and a huge thanks goes out to the Pioneer Woman for creating this. 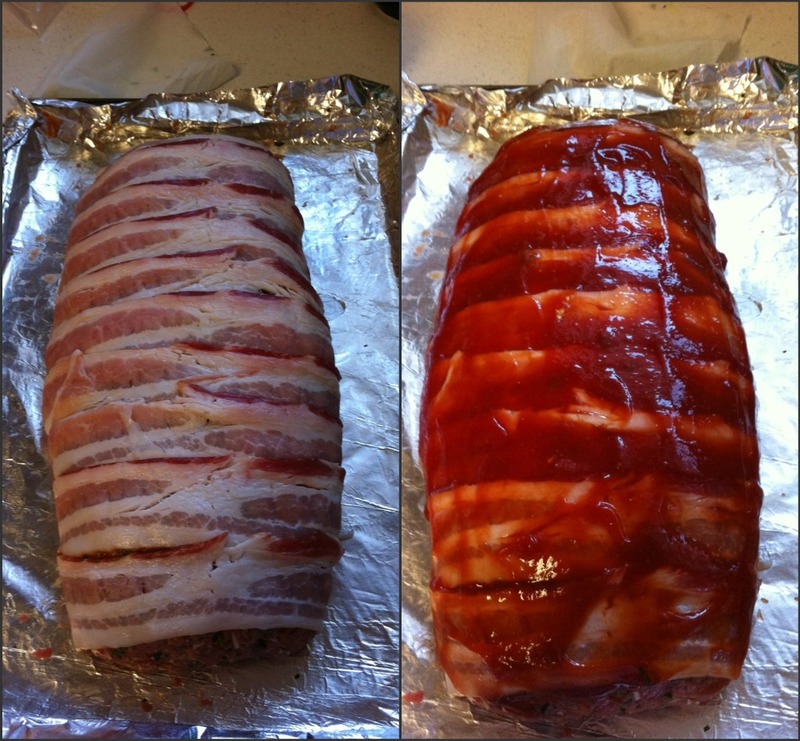 What is better than meatloaf that is totally wrapped in bacon and then smothered in a sauce that is better than plain ketchup any day of the week? Nothing. The only thing I did different was add onion and garlic because they need to be in just about everything that I make but other than that I did nothing else… I even bought plain old white bread because that’s what the Pioneer Woman said to use! Try it and you’ll love it too! Did you make anything this week that was awesome? 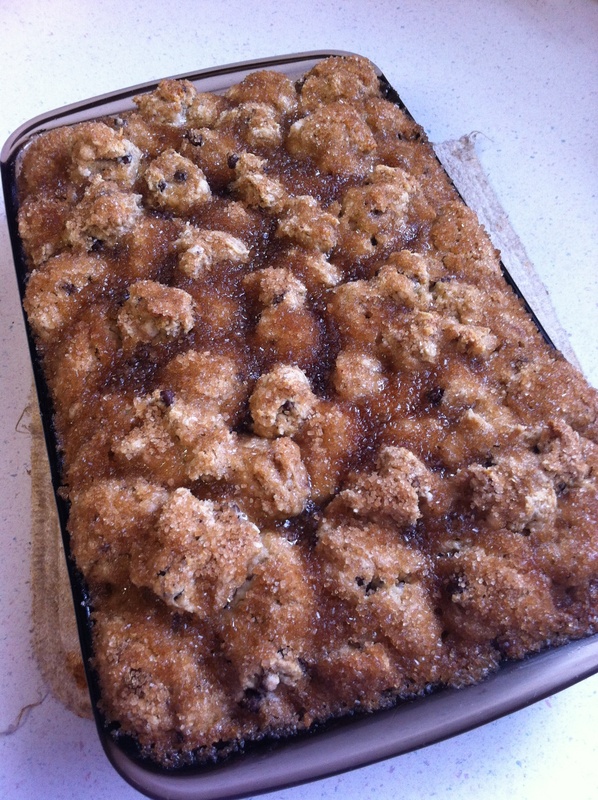 What do you think… was my week a recipe fail or not?